Welcome to the place where I thrive on making, baking, DIY and decorating. Most of my decorating involves using vintage trinkets, treasure and other quirky things. Have you heard of TED? Well I hadn’t until about July of this year when my friend and fellow blogger from You Can Always Start Now told me about it. TED stands for Technology, Entertainment, Design “Ideas Worth Spreading”. Check out wikipedia for more information. Being the nosy Nelly that I am naturally I had to go check it out and was instantly hooked. I think the thing that appealed to me the most was the fact the talks were under 20 minutes and I could listen to them just about anytime/anywhere. One of the talks we both listened to was Matt Cutts- try something new for 30 days…( oh and by the way his talk is under 5 minutes)!!! This talk and the fact my friend was already doing 30 day challenges started me on my journey of my own set of 30 day challenges. I have been doing 30 day challenges since July. I will tell you about those in another post, and I will admit one of them was an EPIC FAIL!!! 😦 but it did not stop me from trying again. 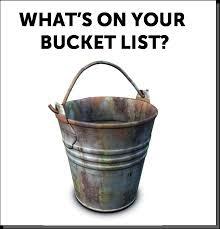 I’ve always wanted to do a bucket list and keep telling myself I will do it one of these days, well one of these days is just around the corner and my 30 day challenge will be to “Create a bucket list of 30 items in 30 days.” I’m a little nervous and a lot excited about this challenge. Wish me luck! I would like to hear if you have ever done this sort of thing or if this inspires you to start, what will you do or not do for the next 30 days?? If you decide to do a 30 day challenge I hope it turns out to be A Wandaful Thing. This entry was posted in Uncategorized and tagged 30 day, bucket lis, challenge, Challenges, inspiration, talks, TED. Bookmark the permalink. Awesome idea. Let me know if I can help. I’ll be doing NaNoWriMo for the next 30 days so the challenge if on!